Yesterday, my family and I went to Washington, D.C. We walked around Georgetown and did a little pre-Christmas shopping. It was a beautiful day to be taking in the sights and sounds of Georgetown, and the place was hopping! Before we left, we were discussing what was in Georgetown to see—and we were talking about the holidays as they are quickly approaching. “You know who’s going to be here in a couple of weeks, right?” my daughter said. I knew who she was talking about. She’s been obsessed with him since we first got him. 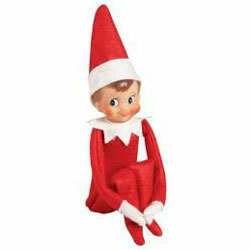 Elfis is our Elf On The Shelf. Every child who has an Elf has to give him a name. His job is to report back to Santa each night on the kids’ behavior and then, the next morning, magically appear in a different location. He hangs from chandeliers, dangles off bookcases, gets tangled in the lights of the tree, and even once, became singed from sitting too close to a lightbulb. We created a makeshift apron to cover his injury, and silently thanked The Lord that he didn’t burn the house down. In our home, he arrives the night we decorate our house. He shows up when there’s a feeling of Christmas spirit and our tree has gone up. Traditionally, we cut down our Christmas tree the day after Thanksgiving. I entertain a lot during the holidays, so we typically get our house ready early. Elfis usually makes his first appearance that night. “I was thinking, Mommy. We should get the girl version of the Elf On The Shelf this year,” she said. For those of you who already have an Elf On The Shelf, you realize, that’s doubling the commitment. We tend to become forgetful as we age. It requires even more diligence. “We’ll see,” I said. My kids are getting older. I was wondering if they could still hear the bell ring, like in “The Polar Express.” I asked them if they still believe. “I always believe,” I said. “Christmas spirit lives right here.” I pointed to my heart. “We do, too. Besides, we wouldn’t get as many presents if we didn’t,” they said. So, now we’ve gotten to the bottom of it. Next Post C-E-L-E-B-R-A-T-I-O-N !!! Woo-Hoo! Our Elf is named “Wishes” One of the best gifts we ever received from some friends. Unfortunately, our dog Mila got a hold of Wishes last year, it was an ugly scene when we arrived home one evening. The kids were in tears! Thankfully, a new one magically reappeared in the morning, but its just not the same. Can’t wait to see if he comes back this year!!! I was hysterical reading this story! What a great one you have…and will have for years to come. RIP Wishes I. I hope Wishes II has a much fuller life. LOL.